A shocking thing about birds is that we are not their only enemy. The hardship of living in the wild world around them is fraught with perils and overrun with predators. So many species have become extinct it gives mankind a greater mandate to preserve everything that is avian. Obviously, it's easy to see that people don't care about the air they themselves breathe. How can we help the birds? Perhaps their greatest threat is the air they breathe and in which they soar. Hopefully in time we can figure out how to keep the air quality safer for our planet and the creatures on it. Historically birds have been used in mines to predict poor air conditions for the miners working there. When the canaries start to die it probably means carbon monoxide or carbon dioxide levels are unacceptable. In recent events we have seen masses of species dying due to chemical exposures from spills and oversights. How can we defend their air when that same air quality is causing humans problems? I am protecting the images of their feathers. I try to know the origin of every feather I use in my art. My goal as an artist is to never harm a bird in acquiring its feather. But what of a bird whose feathers became available to me because it was killed by a predator? I'm torn here. What is my responsibility? The goose feather shown here has not been prepared for art. I discovered it near my neighbor's geese. It was not molting season. My other neighbors recently had predation too. Their flock of turkeys was attacked ironically on Thanksgiving. They were decimated by coyotes. 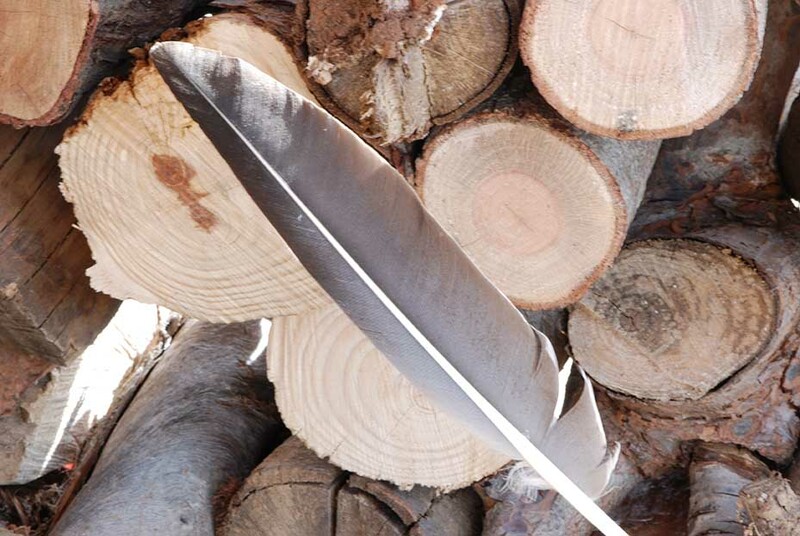 The turkey feather seen here was salvaged from the massacre that was routine among the animal kingdom. The entire flock was taken, but one was saved. Would I be justified to take feathers like these and use them in my art? How would it make you feel if you acquired an artwork that used a feather known to come from a kill? Would it change your opinion of the art? It brings to mind predators and their rare feathers. My proposed museum of all feathers desires to include every feather known. Yet in the U.S. only native Americans have access to the sacred feathers like hawk and eagle. I only need to use them briefly to photograph them with a small setup and my macro camera. I want to photograph every feather known and I hope to approach zoos and conservatories to borrow their molted feathers for posterity. Lately I added to my feather textiles catalog. I hope you enjoy fabric designs that cater to designers, quilters, wallpaper, gift wrap and decals.